One more gift guide for you guys! 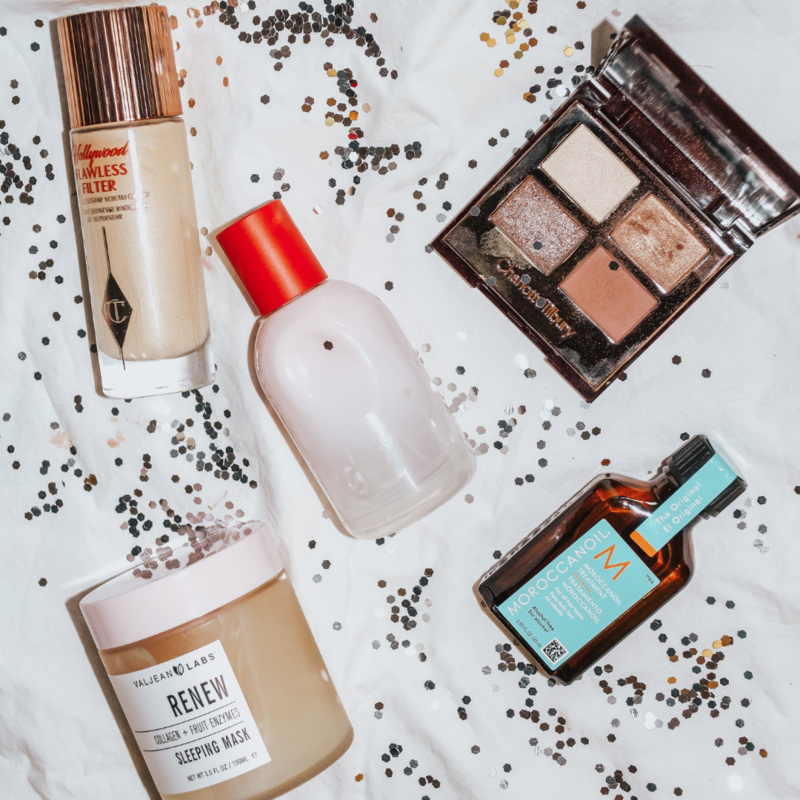 For this one, I really wanted to hone in on special treats that are definitely on the luxury side of things, but are all products that I use on an almost daily basis (so not just a pretty thing that will take up space on your shelf but won't ever get used). Charlotte Tilbury Exagger-Eyes Palette: stunning eye-brightening, super blendable, everyday shades in one compact, travel friendly eye palette? Yes, please! True, I included this on a separate gift guide - but if you are gifting this, why wouldn't you want one for yourself?! I find that rose-golds and reddish brown shadows are so beautiful on any skin tone, and, are so wearable. For everyday I'll take the rose gold shade on my lids with a bit of the reddesh brown in the crease. To amp things up for a date night or holiday party, I'll take the sparkle shade onto the center of my lids, and the pale ivory onto the inner corners. Moroccan Oil Treatment: I can't ever run out of this smoothing treatment that leaves the ends of my hair feeling so, so soft and looking shiny + healthy! I am always afraid of using any kind of oil on my hair (trials and tribulations of someone with an oily scalp), but this oil never leaves my hair looking or feeling greasy. Also, great if you color your hair, or style it frequently. Valjean Labs Renew Sleeping Mask: don't feel bad asking for this collagen + fruit extract sleeping mask - it won't break the bank at $15, but trust me, your skin will look like a million bucks after using it a few nights per week. Perfect if you want brighter, softer skin this winter! Charlotte Tilbury Hollywood Flawless Filter: what a treat this is! Nothing helps to bring back the glow in the dead of winter like this gorgeous golden champagne cream that blends into skin so beautifully. If you're looking for something to help you achieve a naturally glowy, dewy makeup - this one is a must! I apply to my cheekbones, cheeks, and bridge of my nose after a lightweight foundation every single day. Glossier You Perfume: if you're in the market for a new fragrance, I really cannot recommend You enough. You won't smell like a flower arrangement or a fruit basket - but instead, a more enhanced version of your own scent, as this mixture really does melt in with your skin. Warm, smooth, peppery, with a little bit of musk for good measure. I've been wearing this scent everyday since I got it, and honestly, I haven't come across anything like it since.